In September, I entered three recipe contests...and I didn't win three recipe contests. One was the Breyer's sundae thing, and another was a burger contest sponsored by Annie Chun's Go-Chu-Jang sauce. The grand prize was a trip to Korea, and while I've always wanted to visit Asia, Korea might not be my first choice. So no harm done. So here's my losing recipe. It was absolutely delicious; the judges don't know what they're missing. And...I couldn't find that damn Annie Chun brand in my supermarket, so I used real Korean gochujang that I purchased from H Mart. Combine pork, garlic and gochujang. Form into 6 patties. Refrigerate an hour or until ready to serve. Place cabbage in a colander set over a bowl. Toss with salt and allow to rest for about 15 minutes. Rinse cabbage well and place into a large bowl. Add gochujang, sesame oil, sugar, lime juice, and scallions and toss well. Refrigerate 1 hour or until ready to serve. Combine mayo, scallions, sesame oil, and sesame seeds in a small bowl. Stir until thoroughly combined. Refrigerate until ready to use. Pan fry or grill about 4 minutes per side until cooked through. 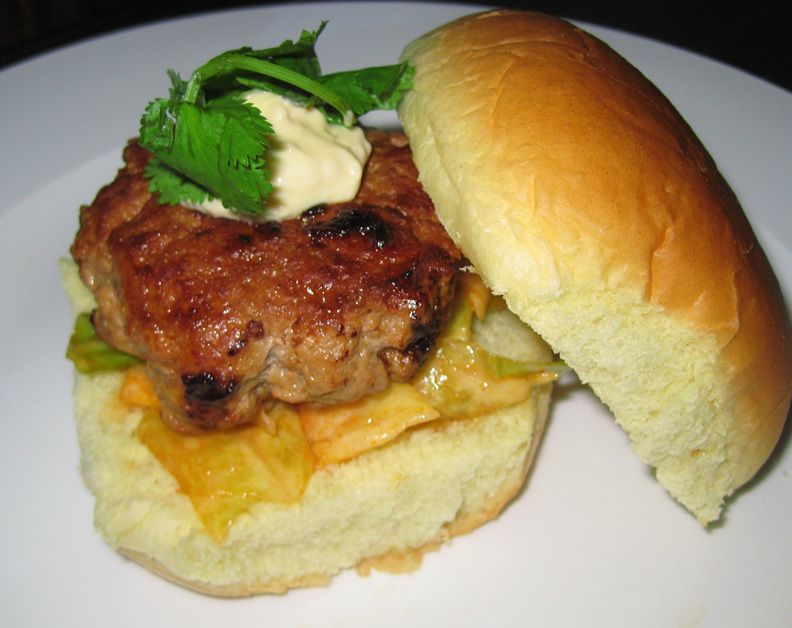 On bottom half of hamburger bun, place a tablespoon or so of cabbage salad. Top with burger, then top with a tablespoon of mayo, and top half of bun. That sounds great. Will try. I have made the banh mi burger you posted about awhile ago and love it.